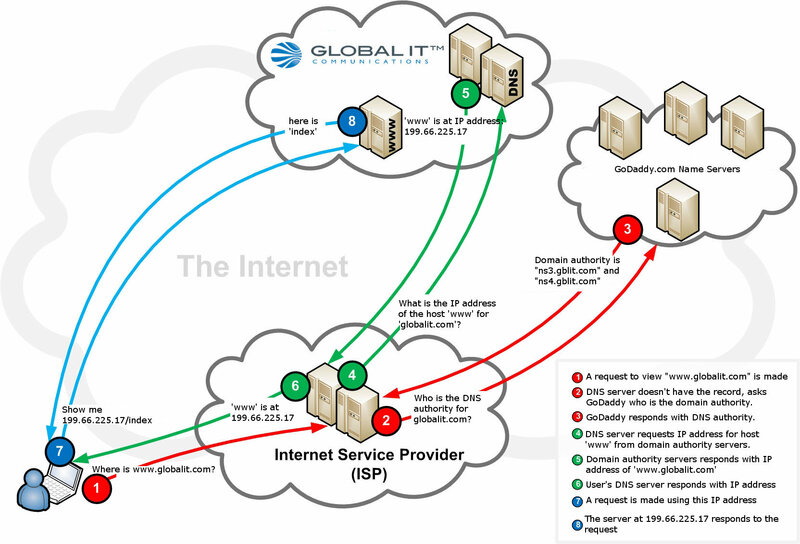 DNS (Domain Name System) is a service that resolves a web address, like globalit.com, to an IP address, like 199.66.225.17, which is the location of a server that is hosting the website. In some cases just entering an IP address will direct you to a website. However, remembering a string of arbitrary numbers isn’t as user friendly as entering an easily remembered web address. While humans prefer to communicate in words, computers communicate using numbers. For example, let’s say you want to go to globalit.com. First, you would open your browser and enter the website you wish to view. After you press enter, a request is sent to a Name Server that checks for that particular website in its DNS databases. If the name isn’t found, the Name Server sends the request to another Name Server. When a match is found, a response is sent back which says “Found globalit.com at 199.66.225.17”. Then your computer records this information in a temporary DNS directory, kind of like a phone book. Now each time you attempt to visit globalit.com, the computer locates it in the directory and directs you to the proper server hosting that website. One of the most well-known free public DNS services is offered through Google. As of 2013, Google Public DNS is the largest public DNS service in the world, handling more than 130 billion requests on an average day. This is part of their effort in making the internet more accessible and easier for the public to use. Many service providers offer DNS servers on the internet for public use. The DNS configurations settings are stored in the device’s or network’s TCP/IP configuration.